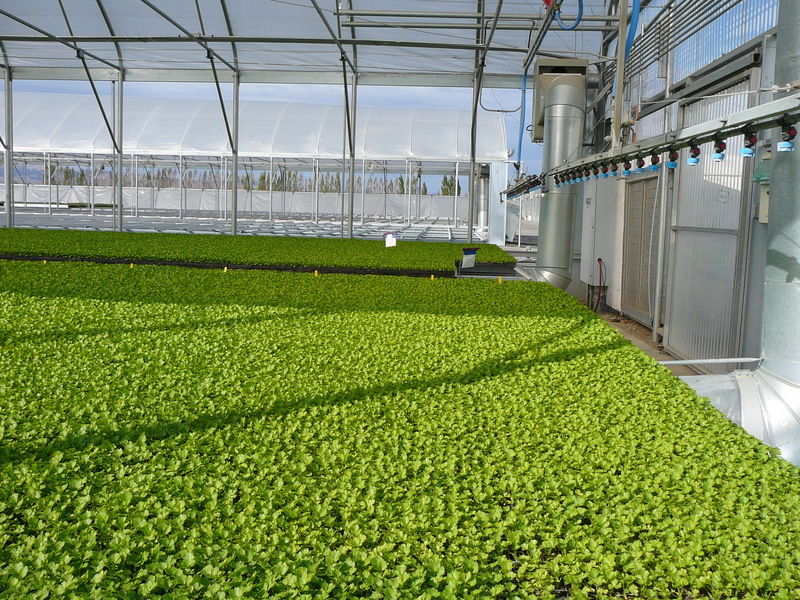 This is an inexpensive yet sophisticated system that utilizes gas-fired blower heaters with ducts, plenums, and punched convection tubes to direct the heat under the bench to the crop zone. Fuel cost is lower since the significant volume of air above the benches does not need to be heated first. The heaters are installed at one end of a T-rail style bench. The heater can be hung from the greenhouse or from a small stand. Steel plenums direct the heat down to the center of the bench where it meets the convection tube. From there the heat is evenly distributed along the length of the house. In the transplant industry uniform growth is critical. The photos show tomato transplants growing on the bench with under bench heating. This system is adaptable to other bench types and crops. Call with your specifications and we will design and engineer a system specifically for you. In addition to the heaters, plenums, and convection tubes, we can supply the bench frames, the T-Rail extrusions, and the greenhouse too. Be careful when ordering replacement convection tubes. Call for proper tube length, hole size, and hole spacing, or order replacements to exact specifications of original tube.